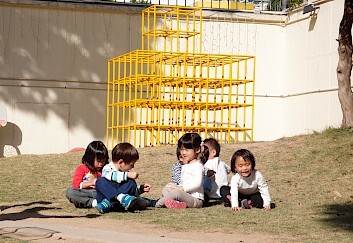 In 2006, founders of Infinity Children’s World (ICW) wondered why there were nearly no help for parents, this realization prompted the establishment of ICW and then the Hong Kong Montessori Research and Development Association (HKMRDA), organizations that prioritizes parent education and helps parents become their children’s best educator. We also offer the only Amercian Montessori Society (AMS) Teacher Education programme in Hong Kong, HKMRDA teacher education programme, Montessori school programmes for children, research and development opportunities, and specialized Montessori materials. We hope that our holistic approach—one that attends to children, adults and the environment— will create a better future for humanity as a whole of, thereby taking human civilization to the next level! In order to transform what we see into abstract concepts, there must be an interaction between the concrete object and our minds. As Dr. Montessori stated, "The education of even a very small child, therefore, does not aim at preparing him for school but for Life." If we believe that children should not be made to comply with the rigid standards and curriculum that adults set, then we need to know more about how humans learn first so that we can offer a better alternative. Through insights gained from scientific observation, we can modify our approaches according to children’s developmental needs at various stages. What we need to do as educators is respect life and support healthy psychological development. If adults force children to memorize things without providing appropriate concrete experiences, the natural curiosity of children will be crushed. The kind of education we embrace does not treat children as empty vessels in which we pour knowledge and information into. Rather, we see our role as if a guide and nurturer; our duty is to support children’s natural learning abilities and assist them in to become the best that they can be. “Peaceful Education” is fundamental to the Montessori approach, which is highly valuable to the city we live in. Hong Kong is a society of fierce competition and this extends to the field of education. There is a lack of compassion, acceptance, and cooperation among people. It is unfortunate that children learn to compete against each other at a young age; when it is all about winning your opponents and getting higher marks than your peers, it is no wonder that children become aggressive and self-centered. Without the promotion of peaceful education at home and in school, children do not get to learn how to share and cooperate, and this dire situation will be hard to change. Many people see the field of Early Childhood Education as a lucrative business but this is absolutely not what education should be. Education is neither a commodity nor a business, and its purpose is not to serve adults. It is all about respecting life. When young children use their hands, their brains are functioning. This is because concrete logical movement is the foundation for the abstract thinking mind; as Dr. Montessori said, “Mental development must be connected with movement and be dependent on it.” This is why learning at this early age should not be dominated by text but rather it should focus more on hands-on activities. Children learn through movement, and only things that children can see, touch, and hear can arouse children’s learning interest. When children’s five senses are fully engaged, these experiences become internalized, and learning occurs in a fun and natural way. When learning is interactive, the positive experience inspires an internal motivation to make discoveries, and children develop a strong sense of wonder towards their environment. Through manipulating different materials that are appropriate to their internal needs, children’s motivation and interest can be sustained, and they will develop a sense of determination that will subsequently release their full potential. When learning is not focused on letter grades, children can learn through exploration in a joyful and pressure-free environment. However if children have to cope with stress and are not allowed to explore the classroom, how can children become active learners? We should be reminded that human beings are the most proactive learning creatures on earth! According to Montessori, children aged 0 to 6 years have a strong “absorbent mind”; this refers to their incredible capacity to take in all sorts of verbal and non-verbal information from the surrounding. Before the age of 3, children’s learning is mostly unconscious, and they absorb whatever information they receive from the environment. From 3 to 6 years old, they begin to learn consciously (brought on by the mastery of language), and their personal character becomes more or less stabilized when they reach 6 years old. Therefore, the first few years are critical in one’s life; the environment that children are immersed in will shape their development. In order to ensure that children gaining rich experiences from a diverse environment that builds up their character, parents must understand their child’s developmental needs; they are the ones who share an ever-present bond with their child, 24-hours day, since the day the child is born. This is why we believe that parent education should start during pregnancy and not just after birth. Our Montessori Parent Education Programme serves parents who have children under 5 years of age; our Infinity Infant class welcomes 1 to 2­year-8-month-old toddlers and their parents; our Infinity Children program is open to children 2.8 to 6 years of age. One of the aims of the Montessori approach is to create an environment that promotes self-directed learning and concentration in children. This environment does not impart knowledge; rather through the dynamic interaction between children, adults, and educational materials, we focus on nurturing children’s learning abilities. As developmental psychologist Jean Piaget (former president of Association Montessori Internationale) pointed out, mental development is a continuous process that lasts from birth till adulthood. Therefore, what we emphasize is the process itself and not the product, and this process is what we find the most fascinating. As Montessori educators, we strive to provide prepared environments that incorporate the outside world into the learning areas, so that children’s minds may be inspired.